When I stepped out the back door yesterday morning to release the chickens from their coop, I was bathed in warm benevolent air. The hens scampered out, murmuring their acknowledgment in chicken language. Another bird language fell upon my ears and I looked up. Yep, the source of the peep-chirping was swallows wheeling angled circles against the blue sky. Oh, joy! They’re back! I spent the day in the garden–in short sleeves. Planted radishes and greens under the plastic tunnel and watered the seeds with a lavish hand. Knelt by the beehive and peered at the workers returning to land on the bottom board. Saw that the pollen carriers on their hind legs were stuffed with orange and pale yellow dust. Wandered around to the front flowerbed where crocus bloom singly and in clumps of yellow white and purple. Bees were busy inside the egg-shaped cups; mostly honeybees but also a big fuzzy bumblebee or two. When I planted the crocus, I was not yet a beekeeper. Now I appreciate these first flowers of spring for working things out with the bees. They provide plenty of pollen, which the bees use to nourish their queen. With the protein, she will begin laying eggs inside the honeycomb they’ve made. 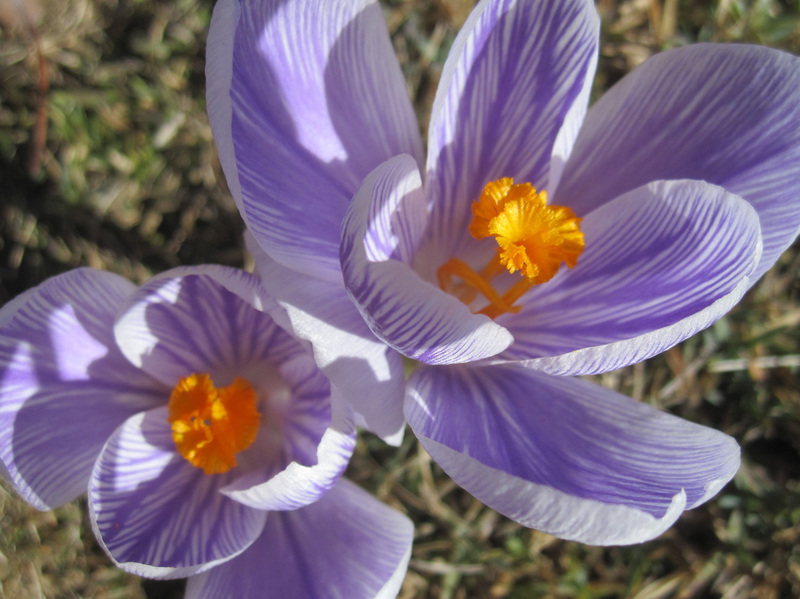 In turn, the crocus receive pollination which allows them to increase as well. And more flowers are coming. I see shoots and buds everywhere. After witnessing over fifty springs, it would be possible for me to shrug my shoulders and say, “Whatever.” I know a few people (snow sport enthusiasts) who go into mourning when spring comes, but I have never been one of them. I adore spring, for no good reason at all. Sure, the light comes back and green returns to the landscape. Birds I haven’t seen for a few months are suddenly here and the world seems very lively. I get to garden, and hang my laundry out on the clothesline. Pretty soon I get to go hiking for work and stay out in the woods all day. I’ll celebrate my birthday on the equinox, and think how lucky I am to have chosen that very day to some into the world. I never get tired of spring’s arrival, even though there will be cloudy days and rain, biting wind, packs of Harley-Davidsons roaring through my little town. Ponderosa pine pollen will make me whirly-headed for a few days and sooner or later I will have to cut the grass. Spring is my reward for being mindful of the other seasons, including winter which challenges me more than the others. Living with four distinct seasons is in my blood and as I grow older I appreciate their transitions more than I used to. It’s easier to rejoice in the way things are. Now go outside–the whole world belongs to you. Dazzling: you, your description, and spring. Thank you for shining so brightly in your space of the planet Indeed, we are the whole of the world–ONE.